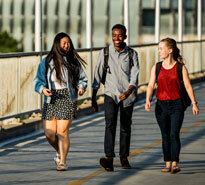 The College of Biological Sciences brings together the necessary ingredients to advance knowledge of how life works and put that knowledge to work to improve our quality of life. The College of Biological Sciences encompasses the full breadth and depth of the discipline with departments, majors and graduate programs spanning the biological sciences. Students and faculty explore living systems at every scale from proteins and enzymes to entire ecosystems. Understanding how life works is the first step toward finding solutions to some of our most vexing environmental and health challenges. Our field-shaping faculty continue to expand research in emerging areas of the biological sciences from genomics to synthetic biology. 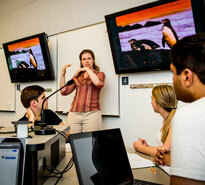 At the College of Biological Sciences, undergraduates are introduced to biology in active-learning classrooms where they drive discussion and discovery. The College has developed signature programs that set the CBS experience apart including: Undergraduates start their collegiate journey at Nature of Life at Itasca Biological Station and Laboratoires where they meet faculty, make friends and learn biology in a living laboratory at the headwaters of the Mississippi River. Back on campus, first-year students join one of seven guilds named after University of Minnesota biology notables. Being part of a community-within-a-community provides them with even more opportunities to connect. They also continue to learn biology by doing biology in active-learning classrooms in the award-winning year-long Foundations of Biology course sequence. One of only two colleges in the country dedicated to the biological sciences, the College brings together researchers who are advancing knowledge of life at every scale from molecules to ecosystems. CBS researchers make discoveries across the biological sciences from illuminating the mechanisms of cancer to engineering enzymes to clean up pollutants in the environment. The College’s award-winning faculty are leaders in their fields. The College has invested in building capacity at the leading edge of the biological sciences as part of a drive to foster collaboration and build research momentum in key areas. The first of its kind, our Department of Biology Teaching and Learning builds on the College’s reputation for innovation in biology education. Faculty in the department investigate evidence-based strategies to transform biology education. Sharing our science with th broader community is a critical part of our mission. College of Biological Sciences scientists and students interact with the public in a variety of ways ranging from the InSciEd Out K12 program to Market Science, which bring science lessons to farmers markets around the state. Research field stations are another important touchpoint. Cedar Creek Ecosystem Science Reserve offers many opportunities for the public and students to learn about ecology and long-term research. On campus, visitors to the College of Biological Sciences Conservatory can experience the region's most diverse collection of plants.